Abdul-aziz had always been a great starter and this was no exception. 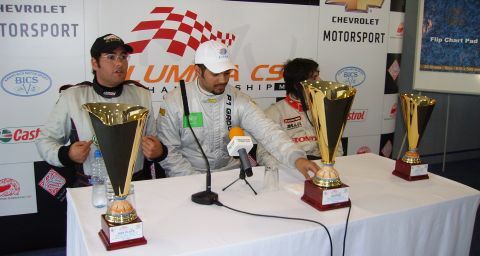 Both he and title rival Al-Musalam had passed pole-sitter Hamada by Turn 1 but both drivers arrived at the corner at the same time. The battle between the two drivers had been fierce all season and neither would give any quarter, so it was perhaps inevitable that contact would take place. What followed looked to me like your usual Lap 1, Turn 1 racing incident but unfortunately Al-Musalem came off worse, had a nightmare race to finish 8th whilst Abdul-aziz won the race with a string of fast and consistent laps. An enquiry into the Turn 1 incident was instigated and long discussions followed with the stewards. The stewards feeling that some penalty needed to be imposed decided that Abdul-aziz should be relegated to the back of the grid for Race 2. The way the races work in this series, the first 7 are reversed, so he would have started 7th, crucially one ahead of his title rival but now he would have to fight from 15th and last. Abdul-aziz also was handed a £300 fine for a fairly innocuous quip he made to the steward which was seen as being disrespectful. 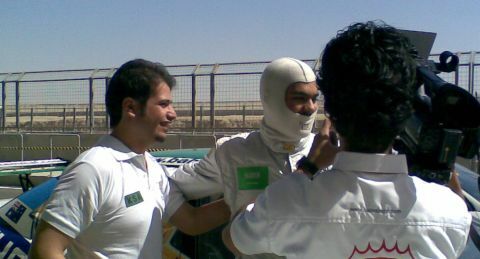 A jubilant Abdul-aziz following a dominant Race 1 win. I had to call on my mental coaching skills to calm the situation and prepare Abdul-aziz for what was an extremely crucial race 2. Fahad drove a very strong race again equalling his best finishing position of the season (5th) and putting in extremely competitive lap times. 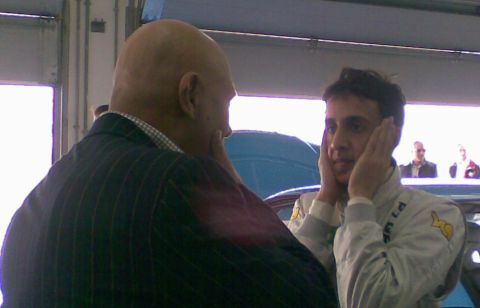 Fahad below with the Marketing Director of UMA (their sponsor) clearly concerned for his team-mate. The race over the long-suffering Lumina mechanics had their work cut out to repair the cars in time.